The price of gold fell back below $1,200 an ounce again last week as the U.S. dollar advanced following another federal funds rate hike. The precious metal logged its sixth straight month of declines, its longest losing streak since 1989. Bad move-the precious metal went from under $300 an ounce to as high as $1,900 in September 2011. 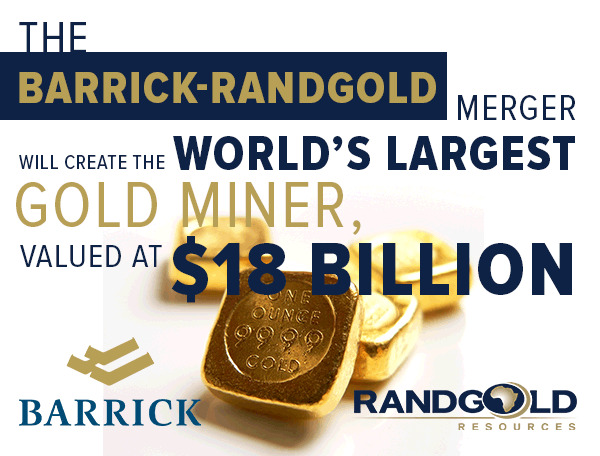 Last week, mining giants Barrick Gold and Randgold Resources announced an $18 billion merger that, once complete, will create the world’s largest gold producer. An “industry champion for long-term value creation,” according to BMO Capital Markets, the resultant company will “operate five of the 10 ‘tier one’ gold mines on a total cash cost basis and possess numerous projects with potential to” deliver sustainable profitability. Historically, a telltale sign that an industry has found a bottom is consolidation. Just look at the wave of mergers and takeovers in the then-struggling airline industry following the financial crisis. Good news indeed as inflation continues to ramp up. The price of Brent oil, the international benchmark, closed above $80 a barrel last week for the first time since November 2014. That’s an incredible threefold increase from its recent low of $27 a barrel, set in January 2016. 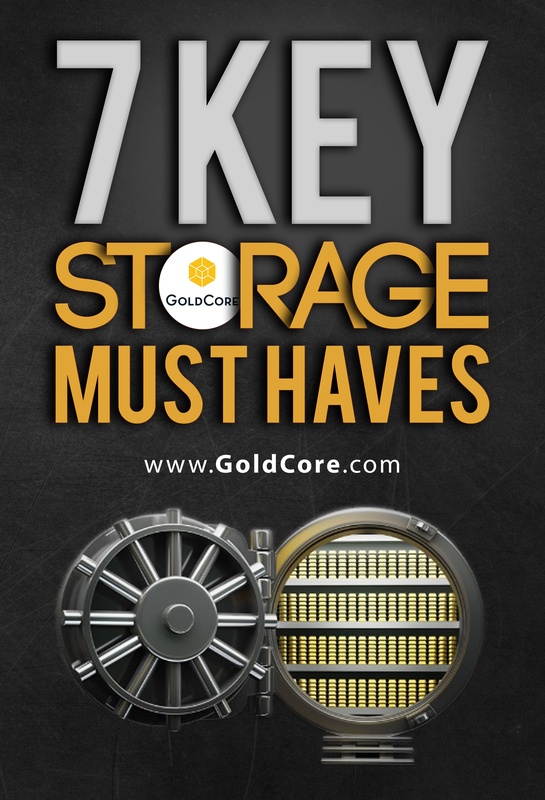 As you already know, one of the key reasons why gold has been so highly valued for centuries-as a commodity and currency-is its scarcity. It makes up roughly 0.003 parts per million of the earth’s crust. According to the World Gold Council (WGC), an estimated 190,040 metric tons of the stuff have been mined since the beginning of time, leaving only 54,000 metric tons in the ground for producers to dig up, at greater and greater expense. Scarcity, after all, is what’s helping to drive the equity bull market even higher right now. Over the past 20 years, the number of listed companies has steadily been shrinking, mostly as a result of tougher securities regulations. And now, those companies-flush with cash thanks to last year’s corporate tax reform-are buying back their own stock at record and near-record levels. In general, Wall Street likes buybacks, which lower the number of shares outstanding. As a result, earnings per share (EPS) and dividends available per share increase even when there isn’t any profit growth. Second, buybacks take shares off the market. 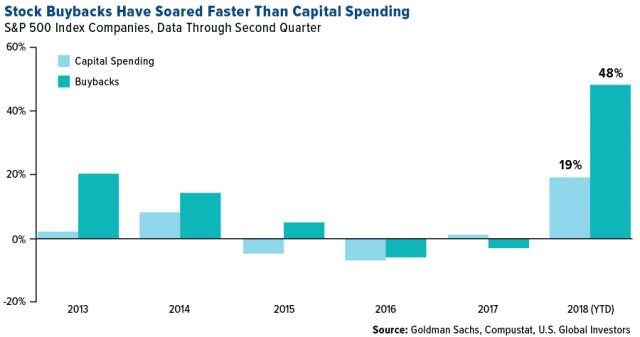 Over the past decade, companies have bought back $4.4 trillion as historically low interest rates created, for some, a more favorable environment to float debt instead of equity. 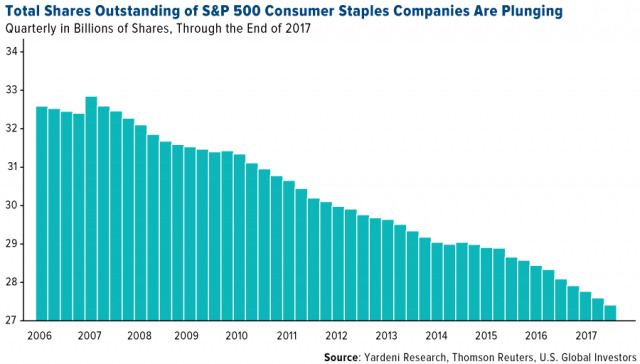 Below, I chose to highlight the consumer staples sector because the decline in shares since 2006 has been so dramatic, falling from around 32.5 billion shares to 27.5 billion shares-a decrease of more than 15 percent. Coupled with the ticking passive index bomb I wrote about earlier in the month, fundamental investing is changing. It’s hard to say where this will end-when there’s only one share of Apple left? Prices would explode, and investing would become even more out-of-reach for many than it already is today. The post Gold Bottoms As Gold Industry Consolidates and Weak Hands Capitulate appeared first on GoldCore Gold Bullion Dealer.